PORT HARDY B.C – BC Cancer screening will be visiting Port Hardy and Port McNeil this April. The Mobile Mammography Service will be in Port Hardy at the Thunderbird Mall from April 23rd to the 25th, and will be visiting Port McNeill at the Black Bear Resort Hotel on April 26th, and May 2nd and 3rd. The service visits more than 170 rural communities across BC, including more than 40 First Nations communities annually. 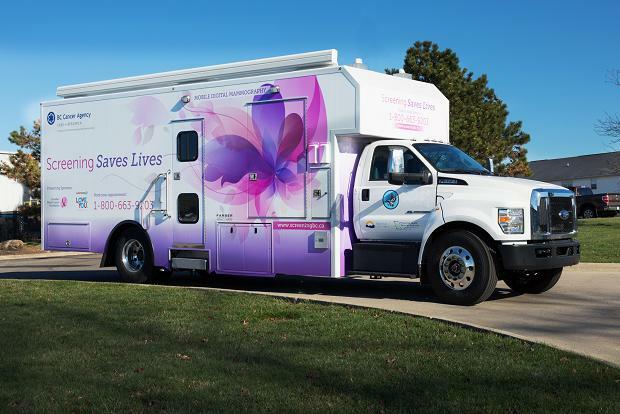 The mobile units are designed for a more comfortable and private experience, with a reception area, dressing room, and mammography examination room all build in. They are also equipped with a wheelchair lift and are designed to fit on all BC Ferries. Dr. Christine Wilson, the Chief Screener for the Screening Mammography Program of BC Mobile Service says the mobile units are vital to help in regular screening. “Our mobile services visit rural communities every year to reach women in more isolated communities. Screening saves lives and it’s important to make sure that women throughout the province participate in regular screening,” said Wilson. It is recommended that women aged 40 to 74 who have a mother, daughter or sister with breast cancer receive a mammogram every year. Women aged 40 to 74 without a family history of breast cancer should schedule a mammogram every two years. Mobile mammography performs about 10% of the total number of screening mammograms in B.C. To book a screening call 1-800-663-9203, or for more information visit www.ScreeningBC.ca/breast.